Since this is the fourth week that we have been harvesting the endive/escarole mesclun, I thought it was high time that I shared a couple of recipes and a little more information about this vegetable. Endive and escarole are both in the chicory family (think radicchio, etc). You may have seen the little heads of blanched Belgian endive at the grocery store. 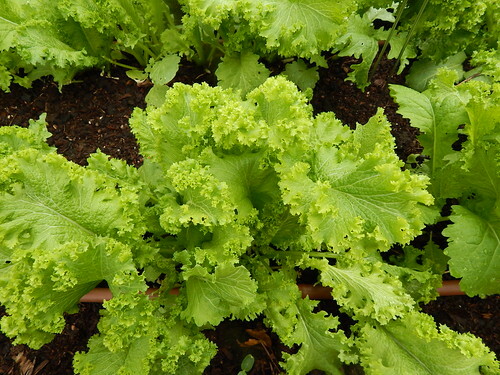 Both endive and escarole have the ability to form heads, although depending on the variety the heads may be more like you would expect of a leaf lettuce or a Bibb lettuce than a cabbage or radicchio. 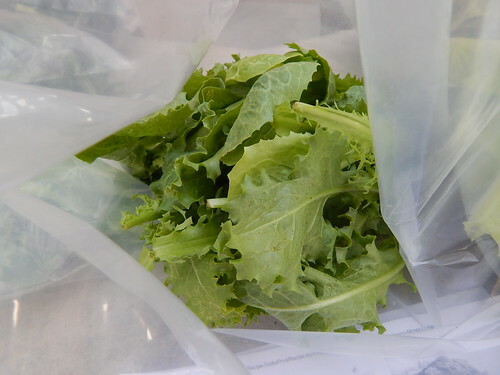 The mesclun mix is designed to be harvested as small leaf salad greens rather than grown for full-sized heads. The catch is that the leaves are a little more on the bitter side than lettuce, which most of us prefer to be on the sweeter side. While there is a bitter tinge to the leaves, I don’t find it to be the same unpleasant bitterness that lettuce can develop as it gets older. One thing I found as I was looking for recipes is that it is a little tricky to find recipes that use the leaves rather than the Belgian endive heads or another head-type chicory. I did find a really simple Endive & Apple salad that I liked and a couple other recipes that looked tempting. 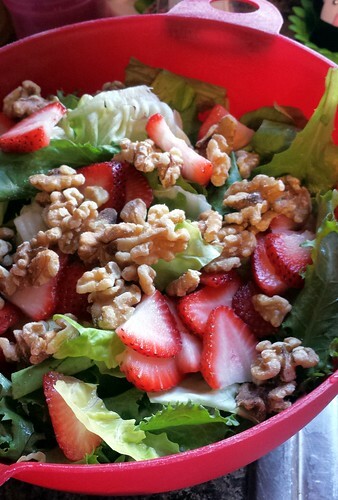 I know, I said apples, but I made it with strawberries & walnuts the first time because that’s what I had. The dressing was just a very simple oil, vinegar, mustard, and seasonings for a viniagrette. It was good! The flavor of the greens did make it a little more robust than just a lettuce salad. I also wanted to try a recipe with cooked greens. This was a very simple Escarole & Beans recipe. 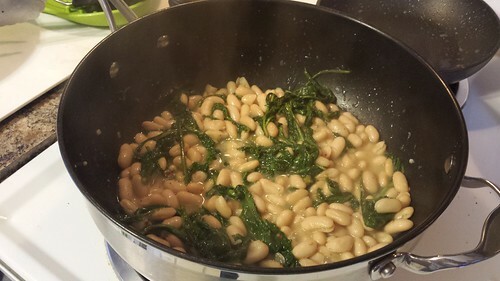 It was very simple – cook the escarole in oil and seasonings, simmer the beans, the mix together and simmer. It was okay, but I didn’t love it. There are some more complex recipes that would probably be better, but as a quick, simple dish, this is a good place to start. Then there were the mustard greens. 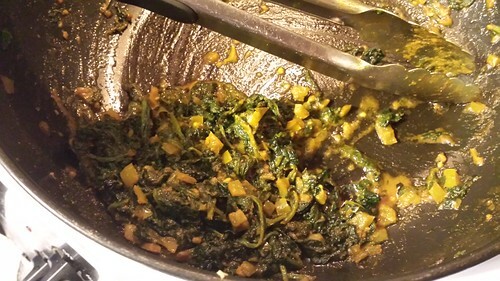 They are traditionally used in an Indian dish called Saag, so I wanted to try that. It certainly looks exotic, doesn’t it? Again, a very simple recipe if you have the spices. Unfortunately, the recipe called for a LOT of spices to the point where it was gritty with spices. It was inedible. Really really inedible. I wished that I had decided to tweak this recipe for Chickpeas with Yogurt and Fresh Mustard Greens instead. It calls for some exotic ingredients, so I wanted to avoid it, but I guess I should have tried it anyway. One of the exotics is Curry Leaves, which we are growing in the garden this year! I’m excited! But it’s not big enough to harvest yet. It also calls for asafetida – another common spice in India, but rarely seen here. It would probably be safe to just leave it out. There will probably be plenty of opportunity to try the recipe yet this year, because the mustard greens are growing like crazy. Harvest? What harvest? 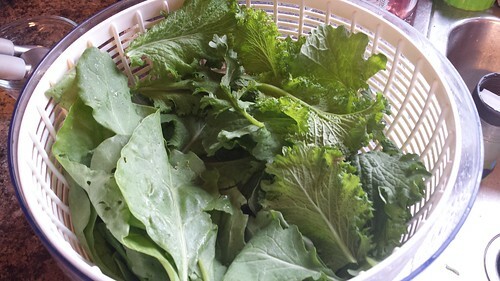 We harvested 3 bags full of mustard greens last week and again this week. And I’m sure it will just keep growing. Yikes! Posted on May 28, 2014, in Harvesting & Eating and tagged cooking, greens, salad greens. Bookmark the permalink. Leave a comment.